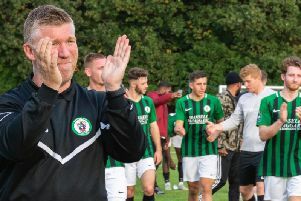 Football fans and clubs took to social media to congratulate Haywards Heath Town after they won the SCFL Premier Division after a 7-1 hammering of Horsham YMCA. Goals from Joel Daly (2), Kane Louis, Jamie Weston, Trevor McCreadie, George Hayward and Melford Simpson gave them the win while title rivals Shoreham lost 1-0 away at Arundel. Loxwood FC: "After 259 days, congratulations to @HHTFC on their @TheSCFL title win, thoroughly deserved showing great staying power." Player Callum Saunders, who missed the last few games of the season through injury after a car accident: "Back to back to back to back to back to back league titles, love"
Mark Beard: "Great to see @HHTFC and all the lads win promotion to the Ryman South. Well done to manager @shaunsaunders52 and @Naim_Rouane #champs"
Loxwood boss David Cocoracchio: "Well done to everyone at @HHTFC for your promotion today to Ryman South from us all at @loxwoodfc Thoroughly deserved!!" Peacehaven FC: "Congratulations @HHTFC been a fantastic fight between you and @ShorehamFC good luck to both sides for next season." Newhaven boss Sean Breach: "Congratulations to @HHTFC and fully deserved. Enjoy the celebrations"
Heath star Joel Daly: "Unbelievable experience to win the league in my first senior season. Would like to thank everyone @HHTFC for helping me through the season"
Burgess Hill Town: "Congratulations to @HHTFC for securing the SCFL Premier Division title today. #SussexFootball"
Hailsham Town: "Congratulations to @HHTFC who sealed the title in style today." Simon Funnell: "Well done to Shaun and all the boys at hhtfc Fully deserved"
Shoreham striker and former Heath player Rob O'Toole: "Congratulations to all @HHTFC hit form at the crucial time and we simply haven't for a while. Hats off"